Adding courses now requires instructor permission after the 5th day of classes. All courses now require instructor permission in order to enroll after the FIFTH instructional day of the term. If you are interested in enrolling in a class during the second week of Add/Drop, you will need to contact the instructor and request permission to register. 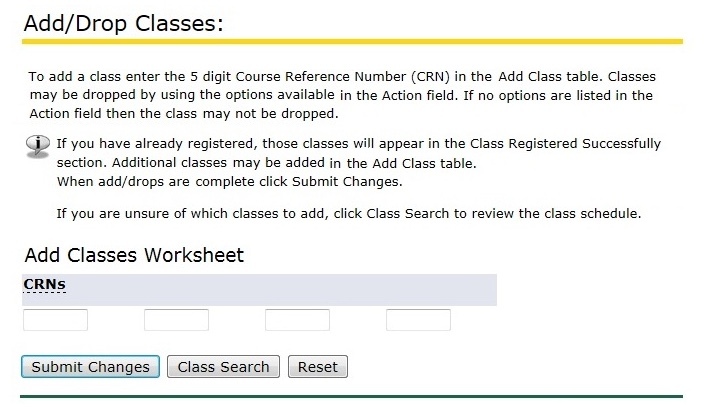 There are no changes in your ability to add courses during the first five days of Add/Drop. There are no changes in your ability to drop courses throughout the entire Add/Drop period. If you would like to enroll in a course during the second week of the Add/Drop period, you will need to contact the instructor to request permission to register. If the instructor agrees, she/he will submit an electronic override for you. You then will be able to register yourself in the course. You will need to register using the "Add or Drop Classes" link and the course's CRN. 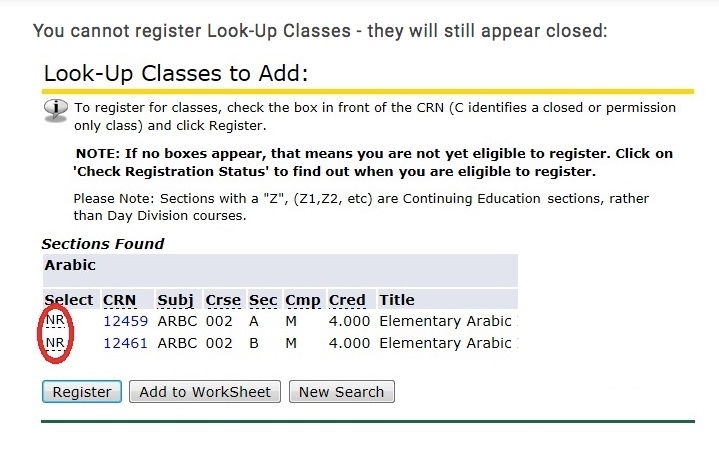 Courses will still appear "closed" even after permission has been granted if you attempt to use the "Look-Up Classes" link. Adding a course after the first five instructional days will be at the discretion of the instructor. "You cannot register Look-Up Classes - they will still appear closed:"
All courses will be restricted against enrollment without instructor permission after the FIFTH instructional day of the term. Students interested in adding your course(s) during the second week of Add/Drop must receive an electronic override from you before they will be able to register. Per the Faculty Senate, this policy will apply to all courses. You may not request that your course(s) be excluded. A student's ability to register during the first five instructional days and to drop during the entire Add/Drop period will be unchanged.